Fuye Aquaculture have more than 10 brands artemia cysts for our customers in the world, our leading brand is "GOLDEN PIPEFISH". If you do not like the brand, we can make the can as your request. Keep out of direct sunlight. For short term storage, store in a cool dry place not more than 30ºC. 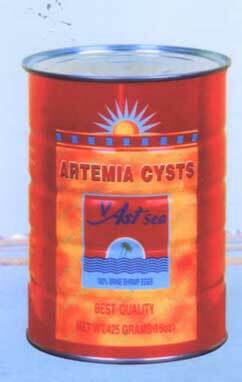 If the Artemia cysts are not used immediately keep the container tightly sealed to prevent the contents from moisture. Once the container has been opened, use within a few days time. Keep frozen at (0ºC) -17ºC or below. For best results, store under refrigerated conditions between 0 °C and +5°C for up to 24 months. •Direct supplier not trading company in China. •Guaranteed the best quality and lowest price.